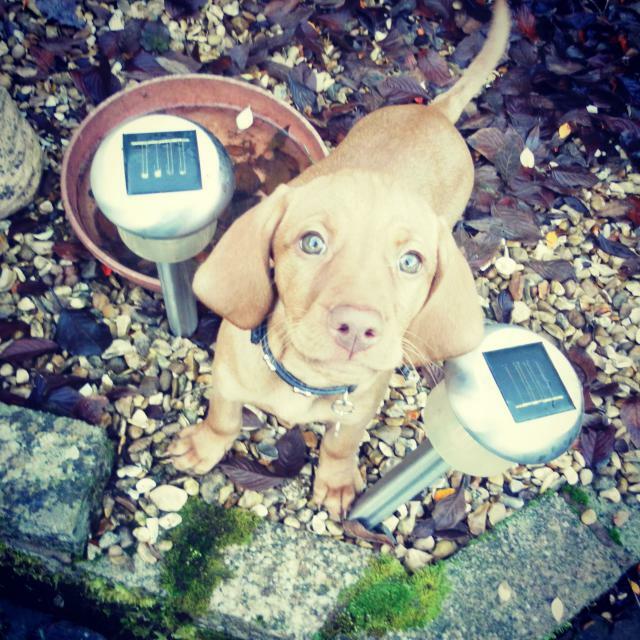 Hungarian Vizsla Forums > General Vizslas > Puppies > How much exercise is safe for a 10 week puppy? How much exercise is safe for a 10 week puppy? Hope you and your Vs are well? Just wondering if you can help me and my partner with some of your advise and experience..
Pepper is now 10 and a half weeks old, fully vaccinated and full of life :-) she currently attends a puppy training class once a week of an evening which knocks her out by the time we get home and then for the rest of the evening. She has a 20 minute off lead walk every morning before we go to work, she is then crated for the day with breaks at 10am and 12pm for toilet and play with me coming home from work at lunch and my mother in law pops in daily. Im then home from work at half four of an evening. We own another dog 'duke' who's a small terrier, pepper and duke are the best of friends and play wrestle alot of the time or run ragged around the garden. We are considering also taking her on a 20 minute off lead walk after work but im unsure how much excersie is safe with her running around with duke so often aswel? How much exercise would you say is currently safe for Pepper at her age? I don't want to hurt her little bones? Re: How much exercise is safe for a 10 week puppy? I think you are on the right track with no more than a 20 minute walk. I feel as long as you keep an eye on how she's looking and acting and go at her pace, she'll be alright. It will be evident when she slows down or if she's not up to a walk. Soon enough you'll be missing when the 10-20 minute walk was enough to tire her out. Another thing that you can use to tire her out in the evenings if she hasn't had enough is training and brain games. Ok, I have to ask, what is pepper's birthday? My Jenny is about the same age, and was born on November 7th. She was born on the 8th November so they are almost exactly the same age.. I noticed that the puppy WILL let you know when she is tired. Our Ginger would lay down or stop and rest if she started getting tired. Just try and be observant. Just had 2nd round of shots last night, and she weighed in at 15 pounds. Where's Pepper? Penny will be fully vaccinated on Monday and she was born on Nov. 11th. A couple of days ago she was 7.4 kilos, about 16lbs. As we haven't taken her out for walks yet I too am wondering how much is enough. We play with her inside and she can go for over and hour, playing really hard. Hi Indy and hcrowder, pepper had her second jabs just over 1 week ago and weighted in at 6.2 kg so they are all pretty much the same weight which is nice to hear. I think she's growing really quickly and healthily, we're trying to predict her weight once fully grown? Anyone with V experience have an estimate? Thank you for your comment organic thoughts.. Pepper is having between 15 and 30 minutes of off lead exercise per day and is loving it. She'll sleep for about 2 hours afterwards though. We used to do that with Chase too. We would take him for long walks off lead with Miles, and then as he got older the walking vs. being carried ratio changed. It gets hard at about 12 weeks! Chase would squeal and cry at times to be let down but I really didn't want him to overdo it. Now at 8 months he comes on the majority of our adventures.